One of the best pieces of parenting advice I ever got was to let David be whatever he wanted to be and to love him regardless. As a non-conformist, that touched me. Especially since the advice came from another young non-conformist who was speaking to me from the child’s perspective rather than a parent’s. So, as much as I love comics and Star Wars and all this other geeky stuff, I’ve made an effort not to push any of it on David. He’s an animal geek by preference, so at age five now, he likes Tauntauns, but that’s as far as his Star Wars (or Star Whores, as he pronounces it) fandom goes. He recognizes Spider-Man, Batman, Superman, and the Hulk, but he’s far more excited by Devil Dinosaur than any of those guys. This is one of his favorite comics of all time. He has good taste. But lately, he’s been getting into Tarzan. He discovered the back-issues of Marvel’s Tarzan on a recent trip to the comic store and now he wants a new one every time we go. (They’re cheap, so I indulge him.) And he’s been watching occasional episodes of The New Adventures of Tarzan with me. I took him to the comic store last night and he picked out this issue for me to buy him. Then, when we got home, we watched an episode of New Adventures that I’d been telling him about where Tarzan wrestles a lion. It’s one of the better Tarzan-wrestles-a-jungle-cat scenes. No stuffed animal for Herman Brix to roll around with. It actually looks pretty dangerous. Anyway, David — as he’s wont to do — immediately identified with the lion and started “attacking” me. We wrestled for a bit until David, sweet kid that he is, decided it would be better if we were friends. If only the lion in the movie had been so smart, he might have saved himself a knife to the neck. 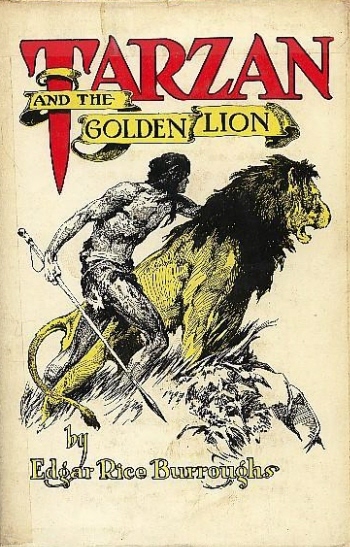 For bedtime, David wanted me to read him his new comic which, as fate would have it, featured Jad-bal-ja, Tarzan’s faithful Golden Lion. David was in heaven. Suddenly, his room was a treehouse, I was Tarzan, and he was my pet lion. It was decided that Diane — who was working at the time — would be Jane. It wouldn’t be half as much fun if I’d pushed it on him, but all on his own he’s discovered a love for both Tarzan and role-playing games. He’s such a geek and I couldn’t be more proud. This entry was posted in david, tarzan by dmichaelmay. Bookmark the permalink. As far as sci-fi versus fantasy is concerned, I hear you about LotR, but I kinda saw the cause-effect relationship the other way.I figured there were all these people out there who dug the fantasy stuff (to my surprise) and so that lead to the popularity of the LotR trilogy.Maybe you’re right, though, and there were also a bunch of folks who weren’t lifelong fantasy fans, but simply liked what they saw in the movie trailers – kinda like how were probably folks who went to see X-Men despite not being huge superhero or comic book fans.